The Newport 433 High-Performance, Low Profile Ball Bearing Linear Translation Stage has a maximum travel of 1.81 inches and will carry up to a 47 pound centered load. The 400 series all have a locking screw and utilize Newports standard actuators. 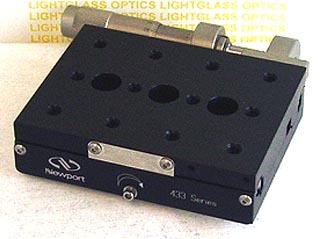 The Newport SM-25 actuator shown in the photo is included in the price. I have differential mikes available at nominal extra cost.